← Google + Motorola = What exactly? Customer Service Meets Social Media: Now What? 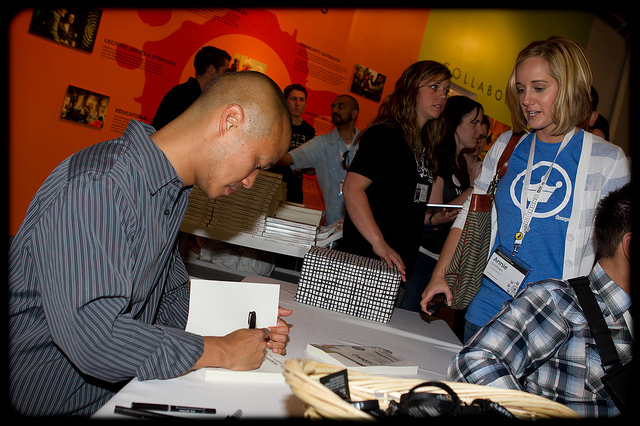 Tony Hseih, founder of Zappo’s, which has consistently led global customer service polls since it was founding, signing his new book. For the last couple of weeks, I’ve been working on a presentation for the LIMRA Social Media Conference for Financial Services. Some of the concepts in that presentation are old hat to me — for instance, the fact that consumers who use email or social media to reach out to companies expect a response at Internet speed. And some of the implications were obvious in retrospect, but took me by surprise when I first began to understand them. For example, Tony Hseih writes in his new book that too oten when the subject of customer satisfaction or customer service is broached within corporate America, people panic. That’s because corporations by and large (with some very notable exceptions) tend to think of customer service as a kind of corporate confessional, where information is dispensed on a need to know basis and tight control is essential. For decades, customer service inquiries between customers and corporations have been private transactions. A customer might share some of the details with his or her family, but in general, it was nearly impossible for a customer to make the content of the call public. In 1984, when I launched the industry’s first online customer service portal for computer users where they could get technical support, customer service, and help with a range of issues from a 24/7 staff of helpful experts, one of the biggest concerns in the boardroom was how we would keep “company business private”. The only way my project was approved was that the IT department assured the board that we could block, delete, and limit access to anything, at any time. Pretty funny in light of the situation companies are in now, isn’t it? Now, a customer can record any and all interactions with the company and have a global audience for the recording, in real-time. Remember the soldiers unhappy over excess baggage fees, who got their story broadcast globally while their flight was still in the air? Or the social media rock star who cost a ground crew at another airline their jobs after he videotaped their interaction with one hapless customer? A friend of mine heads the call center at a large mortgage company, and over the last few years, he’s been on the front lines in the housing crisis, walking that fine line between informing customers of the consequences of not making timely payments, and helping other human beings navigate the foreclosure maze. “You’d think that when they’re talking about their inability to pay their mortgages, people would be just a little bit concerned about their own privacy. And they are if they think that we’re going to do or say anything that might embarrass them. So we were surprised when our CSR’s first started showing up on YouTube or some other online forum. And we were gobsmacked when one of our employees was heard, on the 6 o’clock news, quoting verbatim from the company policy manual,” he says. The fact that the family had stayed in the home for over 14 months after they stopped making payments on their mortgage, and failed to follow through on no less than three work-out offers, including having the mortgage lender waive all late fees and lower the interest rate twice, wasn’t part of the media storm which followed the customer’s release of his audio tape of one interaction with customer service. Take it offline whenever possible — then report successful resolutions online. If you can’t take it offline, stick to your policies and procedures and don’t engage in a war of words. Don’t hire a social media expert — they aren’t customer service experts, and customer service experts aren’t social media experts. Train, hire, and develop a process that works for you and uses everyone’s area of expertise. Opting out isn’t an option — you’re already being talked about in social media. Don’t feed the trolls — not every customer deserves VIP treatment, and learning to spot troublemakers without a legitimate complaint is vital. In the meantime, tell me what you think of my five basic rules for handling the inevitable day when customer service meets social media at your company. Photo credit: The photo was made available by photographer John Meyer on Flickr under a Creative Commons License. Gallery | This entry was posted in Uncategorized and tagged customer service, Deb McAlister, LIMRA Social Media Conference, online customer service, social media, social media policy. Bookmark the permalink.